Use ACH transfers to send funds to your users. Get up and running with Dwolla’s clear and supported integration process. Once you’re set up with Dwolla, save time by never inefficiently processing paper checks again. With Dwolla, as your business and transaction volume grow, your costs remain consistent. At Dwolla, security is a part of our culture. We are always improving to make sure we continually earn your trust. Dwolla simplifies a complex process so you can handle payments in a way that actually pays off. Micro-deposits are an easy and traditional way to verify a customer bank account. Bank verification for developers in just a few lines of code. 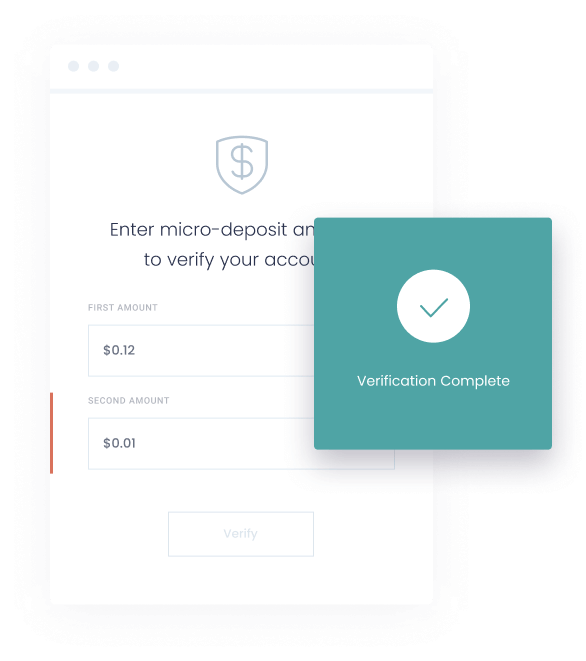 Dwolla.js powers instant bank verification within your Dwolla API application, never hitting your servers with customers’ sensitive financial information. Manage customers, view transactions and find business trends with Dwolla’s user-friendly dashboard. Bolster your integration with our integration partners. Sift Science helps you detect and prevent fraud with easy to integrate, real-time risk scoring powered by large-scale machine learning. Dwolla offers customized levels of support—from self-service to white glove, even customized professional services—across our various plans. Choose the level of support that fits your business needs. When you succeed, so do we. Put our experts on your team! We’ll work with you to create custom features that make Dwolla even more valuable for your business. If your company needs a specific type of report, or a unique tool or a custom feature of any kind, Dwolla is available to build it for you. With Scale and Enterprise plans, you have a direct line of communication on Slack with Dwolla’s developer advocates and account managers to receive near-immediate responses. Scale and Enterprise plans have a dedicated customer success manager providing support, insight and resources to solve product or service-related issues.